Get the FREE TalkZone App! Internet Talk Radio is growing exponentially. TalkZone is leading this growth. Recent figures show that 160 million US Internet users now listen to online radio regularly. Millions more listen around the world. TalkZone offers this fast growing Internet audience high quality talk programming. We're a true Professional Podcast Platform, where outstanding hosts present quality spoken word shows to a growing audience of loyal listeners. If you've ever visited an amateur blog talk site or vanity talk show site, we think you'll find TalkZone a refreshing change. Our rapid growth is the result of our commitment to top quality sound, talented hosts, advanced technology, and intelligent site design. We're always searching for new hosts who have a passion for doing their shows. 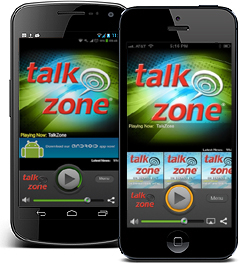 TalkZone provides a full array of services: advanced web streaming technology, mobile apps for all platforms, a podcast library of your shows for on-demand listening, and much more. We include complete marketing, advertising and sales support, along with proven brand imaging and the professional look and sound that's so important in today's multimedia world. It's the attention to detail that sets TalkZone apart. Our established network will help you reach a national audience of listeners. And unlike other sites, TalkZone offers our hosts the powerful potential of both Internet Radio AND Over-The-Air Radio Syndication. We have shows on nearly 2,000 broadcast radio stations across America, distributed via satellite, and our company specializes in radio syndication. To learn more about becoming a TalkZone host, simply click here. TalkZone.com is a registered trademark. Copyright ©2019 All Rights Reserved.